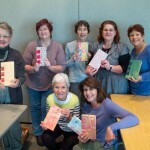 All the participants at the February meeting had a wonderful time making their ribbon books. 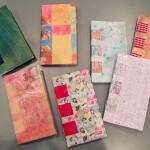 Thanks to Eugenia Uhl for another terrific bookbinding project! 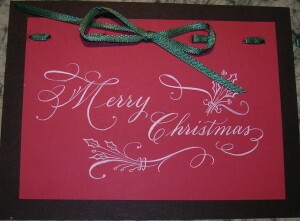 It’s Christmas once again & time for our holiday card exchange. Please join us on December 12th at 10:00 AM. 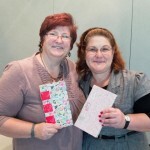 Bring a handmade card & your favorite cookies to share. 300 North Broad, New Orleans, 70119. 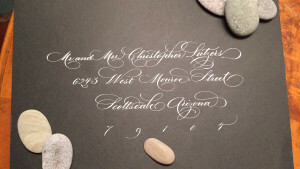 This is a lovely way to greet the holiday season with calligraphy & good friends. 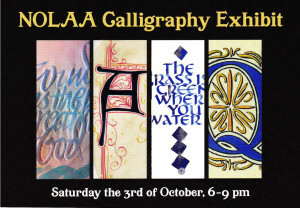 The NOLAA Calligraphy Exhibit is fast approaching but it is not too late to participate. This is a wonderful chance for the public to see the beauty of calligraphic art. The opening will take place during Art for Art’s Sake on October 3rd & will remain on exhibit through November 6th. We encourage members of all skill levels to enter a piece. The opening reception will include live music and refreshments, so bring your family and friends! Several members of our guild are not only talented calligraphers but also wonderful teachers who offer classes in calligraphy & bookbinding. 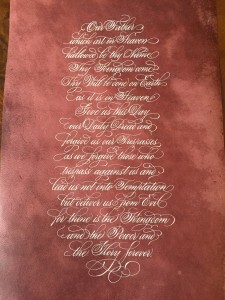 Roxanne Beard will offer a Copperplate class on September 26th. Yvette Rutledge of Mystic Blue Signs has a variety of classes throughout the fall. 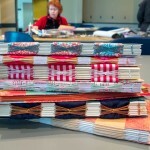 Eugenia Uhl offers classes in bookbinding & calligraphy. 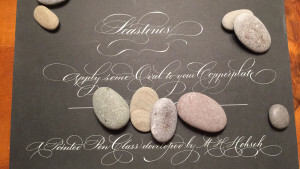 For more information click on the Calligraphy Classes tab in the main menu on the left. The Board of the New Orleans Lettering Arts Association has been meeting all summer to plan very special activities for our calligraphers in the coming year. Send in your dues today!